In 2008, the City of Fort Wayne developed Barr Street from Wayne to Main, adding quotes carved into new brick along the sidewalks and a Ribbon of Community alongside the east wall what would become Citizen’s Square, formerly Wolf and Dessauer. Copied from Talking Sidewalks including some photos by Nancy McCammon-Hansen published June 16, 2014 in History Center Notes & Queries blog. The History of Fort Wayne’s Bars and Taverns: From the Jesuits to World War II 15 page paper by David B. Lupkep presented October 2, 2015 at the Fort Wayne Quest Club. Internet Archive has dozens of publications for Taylor University similar to the one below. Movie Theaters in Fort Wayne, IN has links to 28 closed movie theaters on Cinema Treasures. Fort Wayne, Indiana Theaters on Cinema Tour lists with some addresses and photos on Cinemas Around the World. 1917 The Journal Gazette newspaper ad lists Picture Theatres and Theater name search of photos and discussions on Indiana News 1 formerly You know you've lived in Fort Wayne too long when... Facebook group. West of downtown Fort Wayne at the north end of Thieme Drive on the east bank of the Saint Mary’s River. Read Thieme Drive Overlook by Tom Castaldi published December 29, 2015 in History Center Notes & Queries blog. Three Rivers Apartments with Image:1966 was posted January 20, 2018 in Fort Wayne Reader by Randy Harter, Fort Wayne historian, author, and the history/architecture guide for FortWayneFoodTours.comwho gave Allen INGenWeb permission to copy his posts and again January 21, 2018 on You are positively from Fort Wayne, if you remember... Closed group on Facebook. While Mayor Harold Zeis (1964-71) gets most of the credit (or blame) for the 1960’s downtown redevelopment, it was Mayor Paul Mike Burns (1960-63) who had commissioned the detailed study of the city’s urban structures and housing that was completed in 1962 by the Rhode Island urban planning firm of Blair and Stein Associates. When Zeis came to office, he focused significant city government time and energy — in addition to developing new residential housing units in distressed areas — to the leveling and renewal of the area bounded by Main, Superior, Calhoun and the Maumee River. In 1965, The Fort Wayne Redevelopment Commission sold property for the initiative’s first downtown urban renewal project, which covered 5.6 acres at the east end of Superior and Columbia streets to the Three Rivers Development Corp. for $250,000. On this ground was then built Three Rivers Apartments which had the financial backing of Indiana & Michigan Electric Co., several of whose executives were also officers of the newly formed development company. This kickoff to downtown’s redevelopment eliminated the 400 block east of both of those two streets that had been home to the Borden’s Ice Cream plant (now Edy’s - which relocated to North Wells St.), warehouses for the Grand Leader and W & D’s department stores, Pettit Transfer & Storage Co., Hagerman Construction and National Mill Supply, all of whose buildings were subsequently razed. Designed by the Silver Spring, MD architectural firm Cohen, Haft & Assoc., Ted Hagerman, Hagerman Construction (who took part in the September 1965 groundbreaking), was the general contractor on the twin-14 story, $6M project. In addition to the two luxury apartment buildings and huge above street level heated swimming pool, they constructed an underground parking garage that held 250 cars and then put the complex’s surface parking lot on top of it. The image shown was taken in September of 1966, exactly one year after groundbreaking, and shows Hagerman’s crews pouring the tenth floor of the east building, with the 1930’s filtration plant in the background. Through the years the buildings have been carefully maintained and continually updated, and the 354 units (covering 17 different floor plans) from 506 sq. ft. to over 3,000 sq. ft. are still considered to be downtown’s “Luxury” apartments, and have the amenities and views to prove it. While it’s amusing today to read the brochures from the buildings’ grand openings in the summer of 1967 where they tout “Appliances are finished in the very newest Avocado color”, and that “All TV’s get channels 15, 21 and 33”, current management assures me that all the avocado appliances disappeared many years ago and you can now have all the TV channels you want. A tip of the hat to Eric Tripp for sharing this image. A week long festival in downtown Fort Wayne began July 12, 1969. 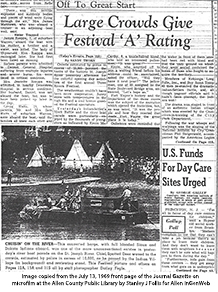 An article was on the front page of the July 13, 1969 The Journal Gazette newspaper. On the banks of the St. Joseph River, 10,000 people gathered to watch a river parade. Copied from TRF through the years by Corey McMaken published July 13, 2018 with photos in The Journal Gazette newspaper. The WLYW raft race in the 1970s was very popular and was the second most highly attended outdoor event behind the Indianapolis 500 race. A 1972 raft race photo shows the large crowds on the banks of the St. Joseph River on the original Great Memories and History of Fort Wayne, Indiana page on Facebook. The raft race ended in 1998 after many successful years. Various reasons given were rowdy crowds, dirty river water, someone drowned, and insurance issues. Due to popular demand the race returned in 2013 when the riverfront development movement began. Website: www.threeriversfestival.org, Facebook page: Three Rivers Festival. 2013 Three Rivers Raft Race [Gallery 49 Photos] byDasFort published July 21, 2013, July 22, 2013 by tonyfranz. Discussed July 5, 2017 on You are positively from Fort Wayne, if you remember... Closed group on Facebook. Three Rivers Festival, Indiana (Images of Modern America Series) 50th anniversary book by Lori Graf was promoted May 31, 2018 on the Three Rivers Festival Facebook page. Three Rivers Festival turns 50: Fort Wayne’s fun event by the numbers by Lisa M Esquivel Long published July 11, 2018 in The News-Sentinel newspaper. Great memories, stories part of Fort Wayne man’s nearly 50 years of volunteering with the Three Rivers Festival by Kevin Kilbane published July 13, 2018 in The News-Sentinel newspaper. Dave Auman has gone to the Three Rivers Festival for 48 years. He and founding board member Tommie Manny were honorary grand marshals for the 50th anniversary. TRF through the years by Corey McMaken published July 13, 2018 in The Journal Gazette newspaper. Three Rivers Festival turns 50: Created as showcase of civic pride for Fort Wayne, its future could include wintertime fun by Lisa M Esquivel Long published July 13, 2018 in The News-Sentinel newspaper. July 14, 2018 a photo of every festival badge since 1974 was posted on You are positively from Fort Wayne, if you remember... Closed group on Facebook. July 14, 2018 Three Rivers Festival parade video was posted on Facebook by WKJG Fort Wayne's NBC TV station. The Three Rivers Water Filtration Plant was constructed at the confluence of Fort Wayne's three rivers in 1933. When it was built, it had the capacity to produce 24 million gallons of treated water per day (MGD). Since the original construction there have been two major additions: a 24 MGD expansion in 1955 and a 24 MGD addition in 1981. The total capacity of the Plant today is 72 million gallons per day, enough to supply the needs of Fort Wayne for at least the next 10 to 15 years. Copied from Three Rivers Filtration Plant on City of Fort Wayne web site. See the Three Rivers Filtration Plant fact sheet on the City of Fort Wayne website. Water Filtration Plant Audio: “Filtration Plant” featuring Tom Castaldi. Courtesy of 89.1 WBOI in the Landmark series by ARCH ( Architecture and Community Heritage). Mayor Hosey’s Three Rivers Water Plant by Tom Castaldi published July 10, 2014 in the History Center Notes & Queries blog. Three Rivers Filtration Plant - 1933 by Randy Harter, Fort Wayne historian, author, and the history/architecture guide for FortWayneFoodTours.com published July 5, 2018 in Fort Wayne Reader, then discussed July 8, 2018 on You are positively from Fort Wayne, if you remember... Closed group on Facebook. See photos and a short history posted August 1, 2018 by The History Center on Facebook. Often confused as "Times Corner" or "Times Corners" is the intersection of 3 roads, Getz Road, Covington Road, and Jefferson Blvd. It refers to a former gas station that had one clock locals referred to as Time Corners. It now has several shopping centers including Time Corner shopping center. Discussed in January 10, 2012 Frank Gray newspaper article. December 28, 2014 discussion on the original Great Memories and History of Fort Wayne, Indiana page on Facebook. Clock located 2016 in Columbia City in June 26, 2016 discussion on Indiana News 1 formerly You know you've lived in Fort Wayne too long when... Facebook group. 2415 Hobson Road - originally founded on Maumee Avenue. Family putting feet first for 125 years by Vivian Sade published October 23, 2016 on The Journal Gazette newspaper . Fred Toenges celebrates 125th anniversary Individual service and pedorthics specialty sustain business as it faces much larger competitors. by Jonathan Robison published October 25, 2016 in The News-Sentinel newspaper. Started as Juvenile Wood Products Inc. on Taylor Street, by Gertrude Muller in the 1920s when she saw the need for folding toilet seats for children. Founded in 1901 in Cedar Rapids, Iowa, Tokheim moved to Fort Wayne in 1918. The Gas Pump Showcase by Scott Anderson - The History of John J. Tokheim and the Tokheim Manufacturing Company in the November 2002 issue on Petroleum Collectibles Monthly covers the pre-Fort Wayne history. Was at one time the world's largest producer of gasoline pumps. Tokheim lost its listing on the New York Stock Exchange in 2000, when it first filed for bankruptcy. On August 6, 2003, Tokheim Corporation went out of business as per its Chapter 11 liquidation filing under bankruptcy when it had 3,700 employees according to Company Overview of Tokheim Corporation on Bloomberg.com. The Fort Wayne plant closed February 28, 2006 Tokheim to close in Fort Wayne today published February 28, 2006 on KPCNews.com. See condensed timeline history in An Illustrated Guide To Gas Pumps: Identification And Price Guide By Jack Sim, History on Tokheim.com. Tokheim on Wikipedia, the free encyclopedia. Intersection of Main and Calhoun streets was the busiest corner in Fort Wayne from the 1890s to the 1960s, here all the trolleys (and later buses) converged from their various routes. Read more about The Transfer Corner posted August 15, 2013 by Tom Castaldi on the History Center Notes & Queries blog. Transfer Corner is Stop #3 in the ARCH ( Architecture and Community Heritage) Central Downtown Trail. Over a dozen photos and discussion September 30, 2017 and October 29, 2018 on You are positively from Fort Wayne, if you remember... Closed group on Facebook. Similar photo from the 1950s and 2017 compared June 29, 2018 by Daniel Baker on Facebook. Photo posted October 25, 2018 by Hofer and Davis, Inc. Land Surveyors on Facebook stated: For Throwback Thursday we share this picture of Transfer Corner at Main and Calhoun. At the turn of the 20th Century you can see Interurban Trains, street cars and horse drawn carts. That is the Courthouse on the left and Riegels Pipe and Tobacco on the Northeast corner of Calhoun and Main, where you used to have the City County Building, or The Rousseau Centre now. BTW...Hofer and Davis provided the boundary and topographic surveys for the City - County Building . More information under Interurban Railroad. Moved their dance house after Robison Park closed, bought the Blue Streak roller coaster from Robison Park in 1919 and was popular until the entire park burned down in early 1950s. See August 24, 2015 discussion on Indiana News 1 formerly You know you've lived in Fort Wayne too long when... Facebook group. A March 21, 2017 and June 2, 2017 discussion and postcard posted March 27, 2017 and June 19, 2017 discussion on You are positively from Fort Wayne, if you remember... Closed group on Facebook. Founded in 1952. headquarters is located in Fort Wayne, Indiana, with an on-site, industry-leading Research and Development Center and Materials Test Lab. Also based in Fort Wayne is the Supply Chain Management Americas, a 90,000 square-foot facility using the latest warehouse management technology, incorporating bar coding and RF scanning to boost productivity and expedite customer orders. From their Company Americas Facts page. Trolley Yard/North Side High School/Centlivre Brewery 1927 by Randy Harter, Fort Wayne historian, author, and the history/architecture guide for FortWayneFoodTours.com published March 16, 2018 in Fort Wayne Reader. 1717 S Calhoun Street. Photo of terra cotta decorations posted September 24, 2017 on You are positively from Fort Wayne, if you remember... Closed group on Facebook.